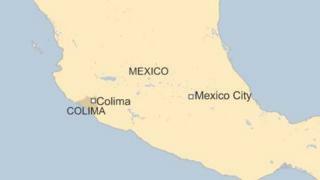 Gunmen in Mexico have attacked the former governor of the western state of Colima. Fernando Moreno Pena, who governed Colima from 1997 to 2003, was having breakfast in a restaurant in the state capital when two gunmen opened fire. Mr Moreno Pena was hit six times but doctors said his injuries were not life-threatening. The motive for the attack is not known. It comes five years after another ex-governor of Colima was shot dead. Silverio Cavazos, who was governor from 2005 to 2009, was killed outside his home in 2010. Mr Cavazos's predecessor in office, Gustavo Vazquez Montes, died in a plane crash when he was returning from meetings in Mexico City in 2005. All three were from the same party, the governing Institutional Revolutionary Party (PRI). The president of the party, Manlio Fabio Beltrones, said those behind Mr Moreno Pena's shooting should be punished "to the full extent of the law". Mr Moreno Pena was hit in both arms, in his hand, his thorax and his neck. Officials said that the fact that the man Mr Moreno Pena was having breakfast with was not injured led them to believe the ex-governor was the target. Police have been posted at the hospital where he is being treated. Mayors and other local officials are often the target of powerful drug gangs in Mexico, but attacks on officials at state level are less common. Colima, a small state in the west of the country, has escaped much of the cartel violence Mexican states on the border with the US have experienced, but violent incidents have been on the rise there.